Holiday parties can mean a house stocked with loud, tipsy guests, excited children and unfamiliar dogs. Each of these “creatures” (especially, those influenced by alcohol!) may take liberties with your pets that they otherwise would not. If it will be difficult for you to monitor all that is going on, consider keeping your birds in a locked room while parties are in progress (or “raging”, as the case may be!). I’ve worked with parrots that thrived in hectic surroundings, such as busy nature centers and classrooms, but these individuals were exceptions. 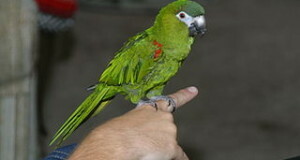 In general, parrots regard strangers and unusual events as threats. It’s important to remember that, however tame they may be, parrots are not domesticated animals, and remain governed by instincts and behaviors that have evolved over many millions of years. 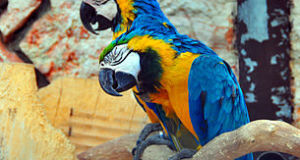 All birds are highly aware of their environments, even though most do not show this as obviously as do parrots. Wild finches, canaries, doves and softbills are on the menus of a wide array of predators, and they are, therefore, exceedingly cautious by nature. I’ve even had small birds die “of fright” in my hand…please keep the delicate natures of your smaller birds in mind as the holidays approach. Parrots that adjust well to strangers, and which spend time out of their cages, face different risks than do their shyer cousins. Most of these threats are well-known, but they bear repeating. Shiny ornaments, unique foods, ribbons, toys and electric wires may all be dangerous to curious pets. 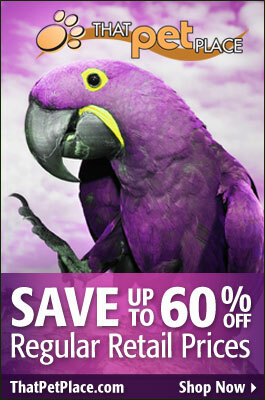 Also, think carefully before offering your parrot a taste of those special holiday foods that may come your way. Since they may not familiar to you, take time to read the list of ingredients. Some hold unpleasant surprises for birds (and us! ), even if they “appear” healthful…there’s a lot more than just “fruit” in the typical holiday fruit cake, for example! I’m not a complete Scrooge…there are many tasty, nutritious surprises that you can buy or make for your pet birds, and for wild ones that you may feed. Please see the article below for holiday snacks that are quite simple to prepare, and check out our line of treats for pet and wild birds. Need a gift for the bird owners on your list? From simple “build your own bird toys” to extravagant, mansion-like cages, the options are limitless. In my opinion, Joseph Forshaw’s classic Parrots of the World makes an unbeatable gift for parrot enthusiasts. Covering the natural history of every parrot species and subspecies, it goes way beyond what can be found in typical pet care books, and is an enjoyable read besides. Sleep: the Key to Teaching Your Parrot New Words? Thanks for your interest. I can check for options, but would need details – where you are located, types and numbers of birds, dates, and so on.